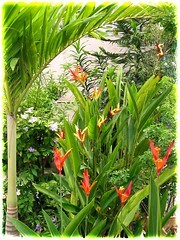 Gardens everywhere evolve unceasingly, including our tropical garden! Day in and day out, plants continue thrusting forward and flowers yelling their heads off, to our great delight, amazement and wonder! October has been quite a wet month with more rainy days than hot days. Somehow, in the month of October, they will always be at least 9 continuous rainy days that always coincide with the Nine Emperor Gods Festival that falls on the ninth day of the ninth moon in the Chinese Lunar Calendar (usually in early October), celebrated by Chinese devotees for nine consecutive days. Don’t ask me why but that’s the uncanny reality. The shades of RED and ORANGE, so glaring and loud but very much loved by us. 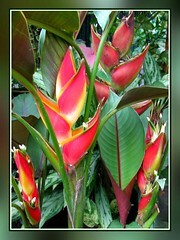 They include Carphalea kirondron, Heliconias, Hibiscus and Tecomaria Capensis ‘Salmon’. The most outstanding among all our flowering plants for October is Carphalea kirondron, whose large and brilliant red blooming clusters are a real traffic-stopper! Aptly nick-named Flaming Beauty! Their blooms will seem to ‘last forever’, for almost 4 months eventually! We’re excited that this very young plant (as shown in the first image), propagated from stem cuttings about 6-7 months ago has issued its first gorgeous blooms! 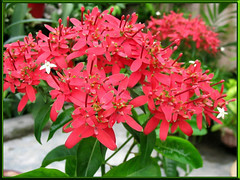 A potted plant below 2 feet tall, yet maturing so fast and beautiful! Simply glorious! The Heliconias too are as vibrant and long-lasting! Of course, Heliconia stricta ‘Carli’s Sharonii’, having larger and brilliantly colored bracts and banana-like leaves with lovely maroonish undersides, outshines the few cultivars of Heliconia psittacorum in our garden. 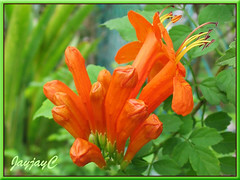 ‘Salmon’ Cape Honeysuckle (Tecomaria Capensis) is equally captivating with its rich and vibrant deep orange flowers nestled against its bright green leaves. It’ll look lovely if properly trimmed to encourage bushiness. 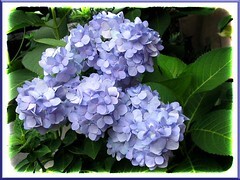 The BLUES and PURPLES, so soothing yet as ‘vocal’ with their lovely presence. We’re absolutely overwhelmed with Hydrangea macrophylla ‘Endless Summer’, a blue variety that has been blooming ever so frequently since it took its first bow in April. Only 2 plants in a pot that’s buried into the ground, yet producing stunning clusters after clusters and seems to get larger each time! I see some more tiny new buds peeping out again at other terminal stems and feel simply blessed with their showers! Yay, it seems to know that we have lusted for it far too long and it is making good for lost years! 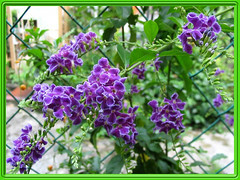 Another attractive plant is the Duranta erecta ‘Sweet Memories’. Simply love their arching branches of pretty purple flowers trimmed in white which are beautifully mixed with golden berries that are a delight to birds too! 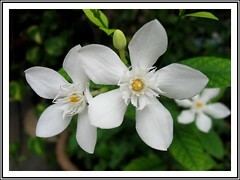 The WHITES, absolutely needed to give serenity and harmony! A lovely cultivar of Spathiphyllum (could it be ‘Mauna Loa’, ‘Starlight’, ‘Supreme’ or some other, I need to google further?) that has shiny dark green foliage with ribbed texture (6-7ins. wide by 10-12 ins. long). 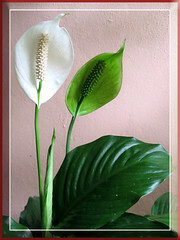 Commonly known as Peace Lily, its snow-white oval blooms measuring (3-4 by 6-7 inches) held high above the mass of foliage are a pretty sight. We normally enjoy one new bloom at a time or the very most 2 as seen in its image below, but of course the other one would have turned green as it ages gracefully and expire. Probably not blooming much being restricted in a pot! 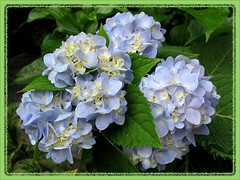 However, their flowers longevity is more than enough to compensate their scarcity. Delighting us too is another plant with cute-looking snowy white flowers that goes by the common names of Snow Flake, Milky Way or Arctic Snow. Botanically known as Wrightia antidysenterica, we simply love their star-shaped flowers that dot and brighten dark places in our little heaven! These are year round bloomers too, how inspiring! Many more flowers to share, but I think I’ll reserve them for another time! Meanwhile, do enjoy these captures, okay!